The world is facing a global sustainability problem of massive proportions. While business organizations have played a substantial part in creating this problem, they are also in a unique position to help solve it. 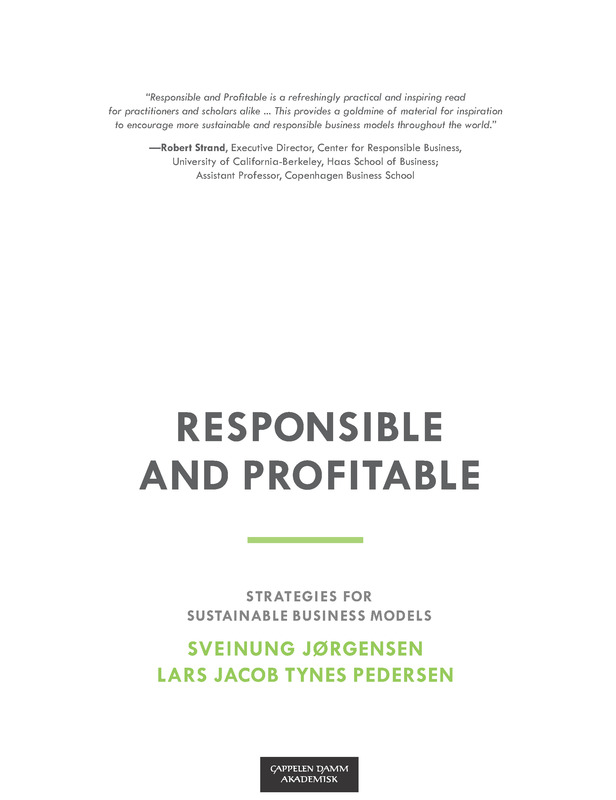 In the groundbreaking book Responsible and Profitable, Sveinung Jørgensen and Lars Jacob Tynes Pedersen show how corporations can design and implement sustainable business models that can tackle the sustainability problem. Based on hundreds of conversations with managers, investors, sustainability experts and other practitioners over a ten-year period, the book reveals how responsibility and profitability can be aligned and the implications for business model design and innovation, as well as strategy, leadership and organization. Through a number of cases and real-life examples from Scandinavian, as well as international business, the authors shed light on how investments in sustainability can help companies better create, deliver and capture value from business opportunities. "Responsible and Profitable is a refreshingly practical and inspiring read for practitioners and scholars alike. This is a remarkably well-researched and well-written contribution. Moreover, Jørgensen and Pedersen offer a behind the scenes view into the sustainability practices of firms based in the world’s leading region for sustainable and responsible business: Scandinavia. This provides a goldmine of material for inspiration to encourage more sustainable and responsible business models throughout the world."